Intro to Small to medium electric drills. Ah ---- Electric Drills, Another Good old Aussie Invention! These portable electric tools consist of a body with a motor, that has one or two handles, an on and off trigger, and a chuck, invariably with three adjustable jaws to grip the cutting tool, the bit. In the small size range there are many drills with keyless chucks. That is a chuck that can be tightened onto the drill bit, just by gripping it in the hand, and activating the drill with the other hand. Larger sizes have chucks with a circular rack gear around the outer edge of the chuck, and a small pinion, the chuck key, tightens it onto the drill bit. There are some portable,(magnetic drill press) and many workshop drill presses that have a taper chuck. That is the end of the drill bit is tapered and fits into the tapered recess of the chuck. The action of the downward pressure of the press wedges the tool into the chuck. A wedge key in a slot in the chuck body releases the tool. The trigger can be a simple off switch, or variable speed swithch, in than the harder you press the faster it goes. Many drills have reverse switches for backing out a drill that may be jammed. In addition many machines have variable gears, some of them mechanical and some electrical. In addition many drills have hammer functions that allow them to use tungsten tipped blades for drilling into concrete and masonry. The size of a drill is the largest size drill bit that the chuck will take. a 10mm drill will take a 10mm drill bit at the shank, and no larger. The smallest are ideal for pop rivets and pilot holes. Pilot holes are the small hole you need to drill before you drill a larger hole. (It has to be slightly bigger than the end of the larger bit before the flutes start). Or of course you may drill a pilot hole for a screw. They rev at a fast 4,500rpm. Generally a smaller drill bit has to rev faster than a larger bit to get the same cutting speed. 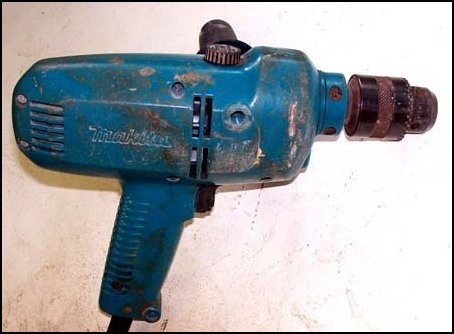 Drills - 10mm makita with a keyless chuck. The one pictured is a 10mm, with a 10mm keyless chuck drill chuck. It only revs at 2,500, but I chose it because the larger chuck would be more useful, The variable speed and reverse are also handy. I still use it mainly for pop rivets though. The chuck is worn smooth through drilling too close to corners, but there is still enough grip tighten it if I grip the chuck first with one hand and then give the trigger a blast with the other. Here's a tip. If you have to drill so close to a corner that you might damage the paint with the chuck, slip a bit of thick cardboard or skinny ply between the wall and the chuck. Drills - Makita 13mm, Hammer function, reverse, two speed gear box. These drills are ideal all rounders. A medium weight drill like this is a good size to fit into one of those accessories that allow you to use it as a drill press. Drilling with a drill press setup has a few advantages over drilling by hand. It is easier and safer to use for drilling small work. A purpose made drill press vise, or a hand clamp will hold the work securely. Repetition work is easy to set up. A drill press drills true vertical holes. Hand held are never as true. Safety tips for Medium and larger drills. Drills can and do grab and can twist your wrist if you don't expect it. If you are drilling something loose with a large diameter bit,clamp it down. Get a solid grip on the drill, both hands, stand firm, and go for it. If you are stretching off the top of a ladder, leaning sideways, one handed, you are quite likely to lose the lot and break the bit, if not worse. Work comfortable, drilling solid and firm at chest height. 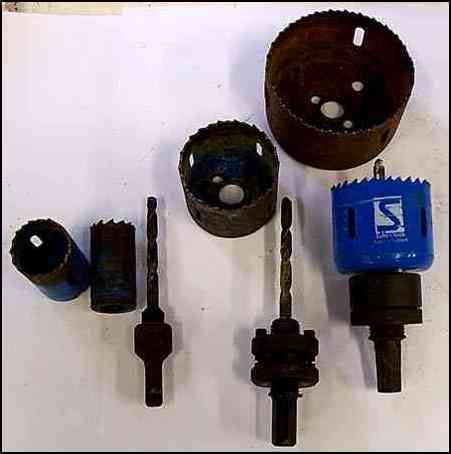 Never drill through and into concrete when using a steel or timber bit. That's a quick way to ruin your bit. Keep odds and ends of scrap timber about for placing under the work and drilliing into. When you are drilling small pieces by hand, if the work is not held firmly, at some stage, usually just before you break through the other side it will try to spin around. A couple of ways to stop this. Use a bench, (could be just two saw stools and a plank) and clamp the work down. If the work is long enough, put it on the floor with some scrap timber under it to protect the drill tip and stand on it. That is, hold the material with your boots. Say you are making a lot of small steel cleats. Mark them out in the long length, drill the holes first, and then cut to length after. Drills - A motley crew, rust pitted but still functional. A few HSS twist drills, 2 stepped, 2 flat bits, a small hole saw, a countersink bit and a couple of chuck keys. Here are a few types of bits and what I use them for. This list is by no means complete, just some of the ones I use. Metal cutting HSS twist drills. Up to 13mm standard and up to 18mm with stepped shanks. I still have a couple of taper shanked drills that I used in a magnetic drill press I hired a couple of years ago. Taper shank is standard for any large size drills in machine shops. They grip so much better. Timber flat bits. They look cheap and nasty, but do a surprisingly good job, if you don't have to drill too deep. Flat bits make a horrible splinter on the back if you burst through without a bit of backing timber there. If you can, drill through until the point comes through the back and then drill from the other side. They are easy to sharpen. A small flat file will touch them up nicely, copy the existing angles. I use mine for drilling the cylinder holes for door locks, among other jobs. 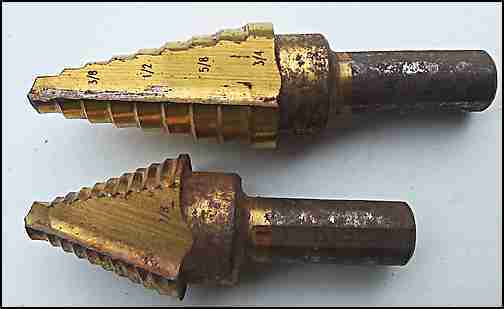 Traditional timber auger bits, but with a machined shank for power tool use. Great all rounder, drills long straight holes in timber. If your drill has a nice slow speed, a sharp auger will just slowly worm it's way through. If you are revving too fast for comfort. keep pulling it out to clear the shavings, otherwis the shavibgs will clog the hole and stall the drill. Sometimes in hardwood they really screw in so well that you can't lift them out of the hole quick enough to clear the shavings and they stall the drill. If I get this happening, and I have a fair few holes to do I take a flat file to the screw thread right at the tip, and file the thread flat in a couple of spots. This stops it screwing in when you are not pushing, and so helps to clear the shavings. I have seen this type of bit in a set, that can be extended in length for drilling through wall frame members. Drills - 4 masonry bits for standard drills with hammer function. The Bottom is one to fit a Hilti rotary hammer drill. The bottom bit is an industry standard type end fitting and as such fits different brands of drill. More to the point you can buy generic ones that are cheaper than the brand name originals. All these are TCT tipped masonry drills, for use with the hammer setting. For concrete and masonry fixings. I have not got a depth stop on my drill so sometimes if I have a few holes to do I stick a bit of masking tape on the bit as a depth guide. 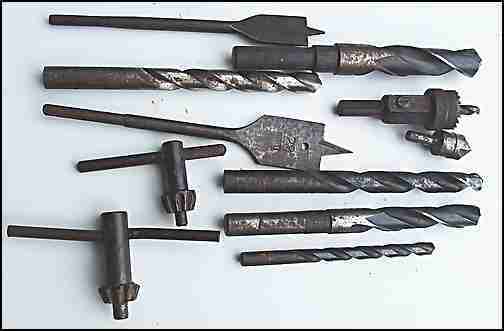 Drills - A group of Sutton hole saws, different mandrels and saws. These saws are HSS for steel, timber, and plastics etc. The hole saws that come in a kit all nested together around one mounting are hopeless for buiding type work. They always break and let you down. When I have a hole through, say 5mm steel to do, I use a drilling/cutting compound, keeping the blade cool and slow revs. For timber, like the 2 1/4" lock holes in solid core doors, I keep pulling it out and cleaning off the sawdust, they seem to clog up fairly quickly. When the pilot bit has gone through the other side of the door, I drill from that side to finish the cut. Drills - A couple of tree bits or step bits. When these first came out we thought they were magic, and they were compared to the alternative. Up on a roof fixing steel purlins, holes not quite right, open them up with a tree bit. for 12mm bolts, for 16mm bolts, same bit, no change bit, NO GRAB!! Steel to steel plates, holes not in line, open them up even 8mm thick, NO GRAB!! Drill large holes in lightweight steel, no pilot holes, drill one hit and NO GRAB!! When they get a bit dull they are always better with a pilot hole first. (Or a sharpen, but they never seem as good as new) . They seem to do a series of burps as they go to bigger holes. They don't replace all the drill sizes they have stamped on them, but they sure make it easier a lot of times. The gold coating on these and other bits that you see, is supposed to make cutting steel easier, longer between sharpenings --- maybe in perfect conditions, hard to tell. I have never had a sharpening jig for HSS metal drill bits, twist drills, but I have worked with guys who have and they swear by them. Very quick with exact angles. I should go and check them out, as I admit that my eyesight is getting shot. For HSS metal twist drills I use a fine stone in a bench grinder, keep a container of water handy and grind very lightly, cooling down the bit often in the water. If you look at a new bit you will see that the clearance angle behind the cutting edge is a curve, starting off at almost nothing. Try to keep that curve, the thick edge right at the cutting point is what gives the edge a resistance to chipping. When you are sharpening as you lightly touch the wheel and roll the bit to get the curve. Keep another bit handy to look at and copy as you go. It is easy to lose the plot completely otherwise. Using a bench grinder to sharpen bits with your hands close to the wheel is potentially dangerous so please follow safety guidelines. Sharpening carpenters flat bits, twist bits and auger bits is easy. Put the drill bit in a vise or clamp it, keep to the same angles and a few strokes with a fine, flat hand file should do the trick. Go To Top :Medium sized drills.